Welcome back to my guest series Weaning Wisdom Wednesdays. Each week, a guest blogger will feature, either by writing their own original piece about what they’ve learnt during their weaning journeys or by answering my set of questions. This week we are joined by Mum of three Amy from Amy and Tots. Hi Amy, welcome to Weaning Wisdom Wednesdays. Please start by introducing yourself and your family. I’m Amy and I blog over at Amy & Tots. We’re a family of 5 and a dog. We have two daughters, the Keira is 3 and Zara is 7 months, and then there is Joshua who is 21 months old. What method of weaning did/do you use? I have tried both purees and baby-led weaning. With my youngest, I just winged it. If I couldn’t be bothered to make something for her to eat than I will give her some puree, mainly shop brought, but most of the time she just has whatever we’re eating. This works best for us. I started weaning Zara when she was 5 and a half months old. She was sitting up unaided, had fabulous head control and an ever growing interest in food. The decider was when she’d sneakily grabbed some food from my plate and started chomping away. To start with I bought a few pouches of puree from the Ella’s Kitchen range. 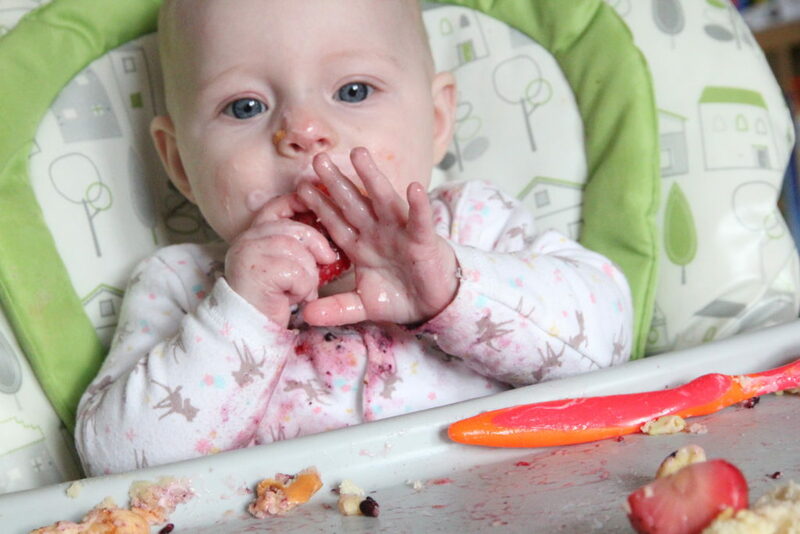 I wanted to include baby-led weaning but as she wasn’t 6 months I was a bit wary. At first I offered her a few spoons of pureed veg at dinner time (this is when she was most content), but it quickly proved that a few spoonfuls wasn’t enough for her hungry appetite and she was one 2 meals a day after 2 weeks. That sufficed until we were a month in and I had to increase to 3 meals. What are baby’s favourite foods? Zara absolutely loves tomatoes, strawberries and bananas. But she’s a right foodie, she’ll happily eat anything. The only thing she’s not eaten so far is Weetabix, she spat them out straight away. I tend to just give her bits off my plate, so whatever I’m eating! She enjoys it and it keeps her quiet whilst we eat. I started off with a Graco highchair, one I’d had since Keira was a baby. It’s a lovely highchair and does the job but it’s so bulky and doesn’t store very well. In the end I’ve swapped to a travel booster seat from Summer Infant (there will be a review up soon so keep your eyes peeled). It’s great, it’s foldable and portable and it’s so easy to clean! I’m not going to lie and pretend to be a perfect parent. All of mine have had the odd McDonads. They always have chicken nuggets and I swap their chips for a fruit bag. I think as long as they are still eating healthy meals, once in a blue isn’t going to hurt them. This relates to Joshua, we discovered when he was 6 months old that he had an egg allergy (and still does now) so he has a very limited diet. It wasn hard finding food that was easy to prepare and didn’t contain egg. He also had a tomato allergy but he has grown out of that now. As far as I am aware, no. I’m not perfect parent and all 3 were weaned before 6 months, by a couple of weeks, but no one has ever said anything to me for this. Do you meal plan or just offer whatever was available in the fridge? Meal planning is not for me. I just throw together what we have. Both the older two are severely fussy eaters so they tend to have the same thing day-in-day-out. A little blender. I tried to make my own purees when weaning Joshua so it came in handy. I was never any good at it though, there must be an art of puree making. Also those big coverall bibs for when letting baby feed themselves. Although I tend to just strip them to a nappy. Absolutely nothing. I was very happy with the way that my children were introduced to solids and even though they’re stupidly fussy I don’t think changing my weaning habits would change that. Follow your instincts. 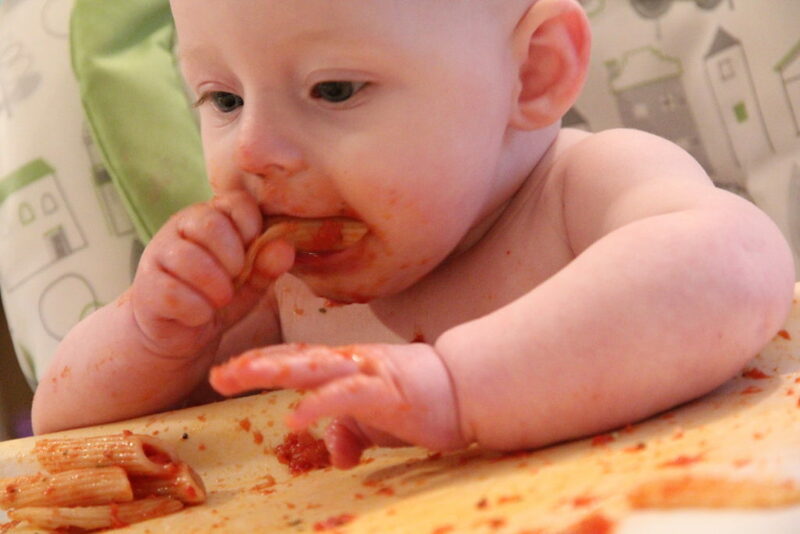 You know your baby, the advice around weaning ages is a guideline only. But I am totally not encourage you to wean your baby at 2/3 months of age “because they’re a big, hungry baby”. There’s definitely something to be said for following your instincts! Love reading these posts.